Another day in the office before I go to London tomorrow. The weather outside looks promising and beautiful. It is about an hour before lunchtime but my stomach started grumbling. Must be the Swiss Muesli not satisfying my hunger. I had a chat with Matt which is the colleague that seats opposite me in our humble office. He has an Iphone like the millions of others that I know. He wanted to show me something exciting which I eagerly volunteered. He took a picture of me with his Iphone and told me to visit his Flickr page. I sort of expected what was to come afterwards. A good looking picture of myself was up on display on his Flickr page. Amazing at that speed. It is not something new or a technology breakthrough but it is cool. Come to think about it, this is the first ever picture I have taken of the office conversion that I seat in. A nice peek to my workplace. Ignore the heaps of stuff at the back of me as they will be moved back into place next door once the renovation is completed. Later peeps till my next post! 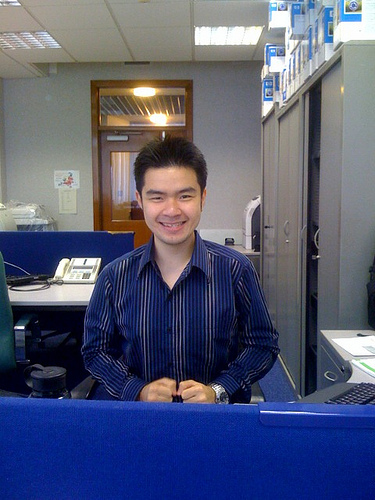 Lol, your shirt match your cubicle colour so well.